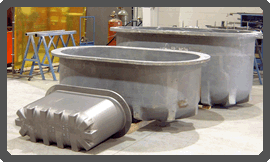 Metamag will manufacture custom crucibles to fit customers application. The pattern cost can be absorbed over a number of casting. Patterns are made of long lasting laminated wood and can be re-used for as many as 40 pieces. The members of this family of stainless steels may be hardened and tempered just like alloy steels. Their basic building block is type 410 which consists of 12% Cr, 0.12% C and balance mostly Fe. with no nickel. Casted 410 series are strong, dense iron of high rigidity and excellent resistance to scaling under most conditions. It is non-growing for temperatures up to 1350 degrees F and possesses good load carrying ability. Recommended for service conditions without thermal shock such as furnace parts, retorts. Withstands rapid heating and cooling without premature failure, offers good dimensional stability and a good range of strength properties.